Herb Mandel with the refurbished violin his father brought with him when he emigrated from Germany in the early 1920s. It was in exploring in my parents’ bedroom closet, where I would on occasion discover things that had been stashed away by my mother that I wasn’t supposed to see until Christmas or my birthday, that I found a true treasure. It was in the early 1930s that I found a long black wooden box almost as long as I was tall. I took it out of the closet and set it down on the floor in front of me. When I opened the lid of the box, wonder of wonders, it was a musical instrument, a violin. What a wonderful treasure, I thought. Where did it come from? Why had I never seen it before? I’ll have to ask Mom about my discovery. My Mom was my confidant, someone who seemed to know everything and usually always satisfied my curiosity. She explained the violin belonged to my father, who brought it from Germany when he immigrated to America before I was born. He loved music and to sing the old German drinking songs and folk tunes, but I don’t remember that he ever played the violin, which I was sure he could if he wanted to. It seemed to me he could do anything. He was my Pop. In fact he was a man of mystery to me because we never had a real father-son talking relationship. He could fix anything, like plumbing, electrical wiring, wallpapering and all sorts of things which fascinated me. I would watch him often when he worked around the house. He had all kinds of tools and saved screws and bolts and nuts and stuff in coffee cans and jars. I admired him with amazement and admiration for all the things he knew and could do. He, however, hardly ever spoke to me while he was working but he noticed I was watching him as he worked. My father was a patriarchal presence in our family. His word was usually the final word about everything. From childhood to puberty, when I asked Pop a question or discussed anything I would speak to him in German – he would answer in German. We never had a real speaking relationship but I believe he was fond of me and he loved me, even though when I was born he hoped I would be a girl child, at least there were rumors to that effect I would hear from time to time (I had two older brothers). He never spanked me or struck me for any reason that I can remember, although he was severe with my older brothers, but I never saw him lay a finger on them in anger. On weekends or holidays, Pop would invite his friends to the house for beer and schnapps and after a few drinks Pop would break into an old German song as they sat around our kitchen table…”Ein Prosit, der Gemudlichkeit” and his buddies would chime in, which would lead into the raising of glasses and more songs from their youth in the Old Country which continue through the night into the early morning hours, with Pop conducting the group, using the index finger of each hand. 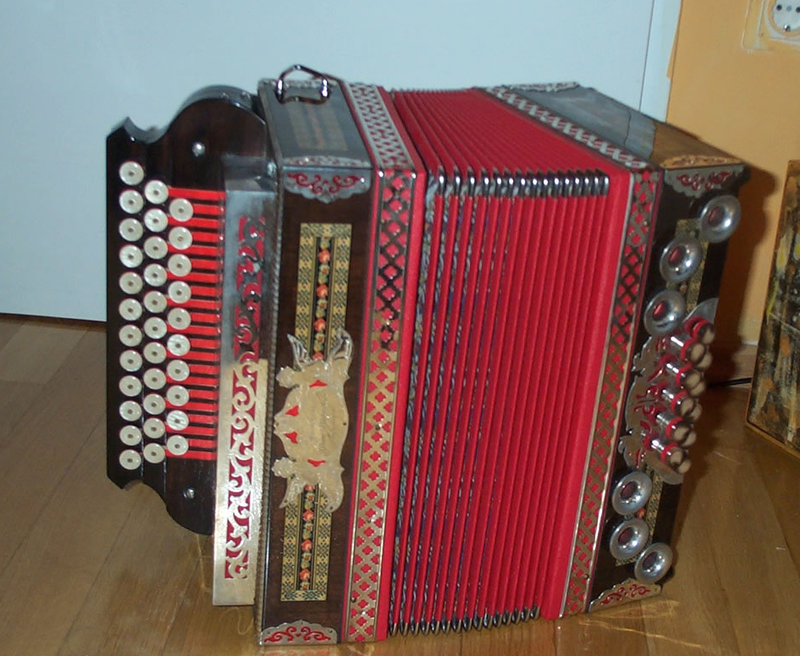 I was taken by surprise one Christmas Eve, when my Mom gave Pop a large gift package and Pop pulled out a new instrument to me, a Ziehharmonika (accordion) which brought a big grin to his face. He immediately pulled and pushed on it and fingered the dozens of buttons, then to my surprise he began playing one of his favorite German drinking songs to which everyone joined-in singing with much laughter and joy. Pop was in his glory. Yes-sireee, Pop was the original “Music Man.” He also had a strong, clear and resonant tenor voice which he exercised as a member of the Gesangverein at a local Association of Male Singers. I’m sure my musical interests were strongly stimulated and influenced by my early childhood exposure to music. Time passed since I had discovered the violin in my parents’ closet. One day, I answered the doorbell (I was allowed to answer the doorbell) but this time the bell rang and it was meant for me. I opened the door to a stranger who had a big smile on his face who after a moment spoke to me, “How would you like to play the violin, young man”? I was confused and startled, but excited. How did this stranger know about the violin? I spun around quickly to find my mother and bring her to the door as I flustered to her the words “violin… man… door” and pulled her hand hard, to meet the visitor. After a few minutes of listening to the man, she invited him into our parlor where he explained about Professor Barrington the teacher, who would teach me to play the violin. He would even refurbish Pop’s old violin at no extra cost, all for only $2 for each lesson. Mom looked at me as only a loving mother could look at her wide-eyed son with loving eyes and agreed that I could begin my violin lessons. I gave her a big hug and the man gave her a paper to sign. The man gave me a pat on my shiny blond head and wished me success in my coming endeavors, perhaps as a successor to the then famous David Rubinoff and his violin, who was featured on Fred Allen’s weekly radio show. Yes, that’s how it all started. I went on to play a command performance by my third grade teacher, before the entire class. The performance was a big hit with the students when I played, “Pop Goes the Weasel” and plucked my E string for the “pop.” I went on to perform for Mr. Rowe, our local Butcher Store owner who paid me with a dime and dubbed me “Rubinoff,” which was his greeting from then on whenever I came into his store. When I was transferred to Ferguson grade school after completing grade 6A at Hartranft Elementary School, I played in the school orchestra at assemblies and special events. When I moved on to Jay Cooke Junior High, I reevaluated my career goals in favor of the visual arts and discontinued my violin lessons. I sort of missed the violin after stopping my lessons and at times wondered what might have been had I given more time to pursuing the violin – maybe even playing in the famous Philadelphia Orchestra. Previous PostPrevious The story of Job: What do YOU think?